Chains as proper enrichment for pigs (incl. supplement) (Book chapter in Advances in Pig Welfare, M Spinka (Editor), Elsevier). Rearing pigs in barren conditions reduces their welfare. Enrichment of pig pens is needed to allow the performance of species-specific natural behaviour like rooting. A metal chain provides rather limited enrichment, but when presented in an optimized way, may substantially improve the welfare of conventionally reared pigs in a most feasible way. The short metal chain can be optimize into the branched chain design. This is a long anchor-chain type chain reaching til floor level, with 2 or 3 shorter chain branches at nose height, and 1 such a branched chain being provided for every 5 pigs in the pen. Bracke MBM. Chains as proper enrichment for pigs (incl. supplement). In: Spinka M, editor. Advances in Pig Welfare: Elsevier (2017). The chapter (without supplement) can also be downloaded here. This chapter primarily compiles work in which the author (Marc Bracke) has been involved with providing science-based decision support on the question of what is proper enrichment material for intensively-farmed pigs as required by EC Directive 2001/93/EC. Proper manipulable material should primarily provide occupation (i.e. reduce boredom), and preferably reduce tail biting. The RICHPIG model was built expressing enrichment value as a score on a scale from 0 to 10. Metal objects like short metal chains had the lowest score. Subsequently, the Dutch government banned the use of metal chains, and most Dutch pig farmers attached a hard plastic ball or pipe to the prevalent, short metal chain. Unfortunately, our on-farm observations repeatedly suggested that this ‘enrichment’ may have reduced pig welfare, rather than improving it as intended by the Directive. So-called AMI (animal-material interaction) sensors can be used to (semi-)automatically record object manipulation by attaching a motion sensor to hanging objects. Exploratory data are presented to, directly and indirectly, record enrichment value. AMI-sensors may provide objective, flexible and feasible registration tools of enrichment value, but their application is still rather demanding. That the enrichment value of short metal chains can be improved upon, e.g. by providing branched chains. Essentially, this entails making chains longer, preferably reaching until the floor, and making them more readily available in a pig pen. To facilitate the process towards proper enrichment the principle of intelligent natural design (IND) is proposed. IND entails organising a repeated selection process of the (currently) best-available enrichment material so as to gradually reduce pig boredom and enhance the opportunities for the rearing of pigs with intact tails. IND should start with basically all pig farmers implementing promising enrichment like the branched-chain design on their farms as soon as possible, followed by conducting small-scale on-farm experiments to compare and improve enrichment through sharing of available knowledge. Suggestions are given as to how and why this novel approach can be implemented to solve persistent animal-welfare problems like providing proper enrichment for intensively-farmed pigs. The video below shows the value of a branched chain provided in the outdoor run of organic pigs. This prototype branched was called ‘enriched chain’ because it was having various branches and reaching till the floor. The prototype was not yet made of stainless steel anchor chain links, but of relatively large c-chain links (2.5 cm wide, 5.5 cm long). It also shows that pigs show signs of frustration when trying to manipulate the hockey-type ball hanging on a short chain. This is a brief note on the use of AMI-sensors and the future of pig farming from the NL partner (MB) in the FareWellDock project. The world is rapidly changing it seems, in major respects. A major energy transition is taking place reducing the dependence on fossil fuels. Agriculture must become more circular to reduce its impact on global warming. Another major transition that is taking place is the increasing role of information technology. Smart farming may soon become reality. 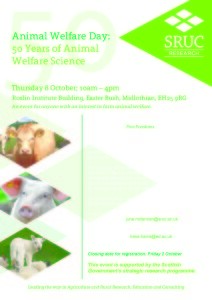 At the same time farm-animal welfare is an increasingly-recognised societal concern. Since I have been working as an scientist on the interface between information-technology and pig welfare for some time now, I thought it could be interesting to share some thoughts on what the future of pig farming might look like. My most recent work related to smart farming, at least to some extent, was on AMI sensors of pig enrichment. AMI stands for animal material interactions. AMI sensors can take various shapes and forms. In some way or other AMI sensors record the amount of interaction pigs have with enrichment materials for pigs. Mostly this concerns hanging toys like chains and ropes with or without suspended materials like pieces of wood. So far the use of AMI sensors is (mainly) restricted to applications for scientific purposes, e.g. to measure the value of (different aspects of) enrichment materials (directly or indirectly), the effect of tail-biting ointments, and abnormal and/or sickness behaviour. Using AMI sensors it was possible to acquire new knowledge about enrichment. For example it was confirmed more objectively that destructibility is important for pigs. And we found that repellents may have some effect in reducing tail biting, and that pigs in tail biting pens seem to be more eager to interact with enrichment than pigs in control pens. (You can find my publication list of AMI sensors and abstracts here.) However, AMI sensors are not ready to be implemented for on-farm use, as their application generates difficulties partly because pig pens constitute a rather challenging environment for electronics but also in relation to how to properly interpret what is being recorded. In 1996 I started my PhD research. I examined ways in which information technology could be used to assess animal welfare. I developed a methodology, called semantic modelling of animal welfare to derive welfare scores based on scientific knowledge. I implemented these principles to assess the welfare state of pregnant sows by developing a decision support system to assess sow welfare (the SOWEL model). A lesson regarding the future of pig farming from my PhD research may be that farmers shouldn’t be expecting that information technology and smart farming is going to make their life a lot simpler. 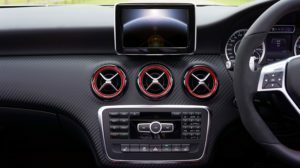 The implementation of smart farming won’t be comparable to farmers buying a sat nav device for their farms, allowing them to forget all about road maps. As the name suggests the FareWellDock project was an international research project aimed to reduce routine tail docking of pigs in the EU. EU legislation has banned tail docking for many years now and it is most likely that future pig farming will require raising pigs with intact tails without much tail biting. This is going to be a major challenge for conventional pig farming. Countries like Denmark, the UK, Germany and the Netherlands are in various stages on the road towards this goal. Some countries like Finland and Sweden may even be said to have arrived at their final destination in this respect. Even in these countries, however, there is a continuing need to reduce tail biting and improve pig enrichment, a major risk factor for tail biting. From my work on tail biting two major suggestions regarding the future can be made. One recommendation extends the previous one, that farming isn’t going to be simple. Tail biting is a multifactorial problem, i.e. many stressors related to enrichment, climate, feed and social conditions, may contribute to it. Underlying most of these risk factors, however, are decisions made by the farmer him/herself. In line with this I have previously suggested that perhaps the pig farmer may well be the most important risk factor for tail biting. Farmers do not always appreciate this. The other suggestion concerns the conventional view that scientists should first solve a problem before farmers should implement it. This may have worked well with problems in the past, but it may not work for the remaining, more persistent problems like improving enrichment and raising pigs with intact tails. It is more likely that pig farmers will have to take the initiative and perhaps even start to do some collaborative ‘research’ themselves (for more details on this idea, which I have labelled ‘intelligent natural design’ see Bracke, 2010, Bracke et al., 2011, Bracke, 2016 and esp. Bracke, In press (forthcoming in june 2017)). Bracke, M. B. M., Wolthuis, M., Zonderland, J. J. & Kluivers, M. 2011. Tails to tell – Tail docking, tail biting and enrichment for pigs – Experiences from the Netherlands. Herning, Denmark, May 25-26, 2011. Bracke, M.B.M. 2016. Enrichment materials for intensively-farmed pigs – From review to preview (Conference abstract, ICPD 2016). In: Kemp, B. Et al., 2016. 16th International Conference on Production Diseases in Farm Animals. June 20-23, 2016. Wageningen, NL. The presentation can be found here. Bracke, M.B.M. In press. Chains as proper enrichment for intensively-farmed pigs? In: Spinka, M. Advances in Pig Welfare. Elsevier. Reporting on the work done in the FareWellDock poject (forthcoming, expected June 2017). Tail docking: The final cut? By Monique Pairis-Garcia. You can read the first part of this article here. For the second part see the original at the Pig Progress site (published August 8, 2016). 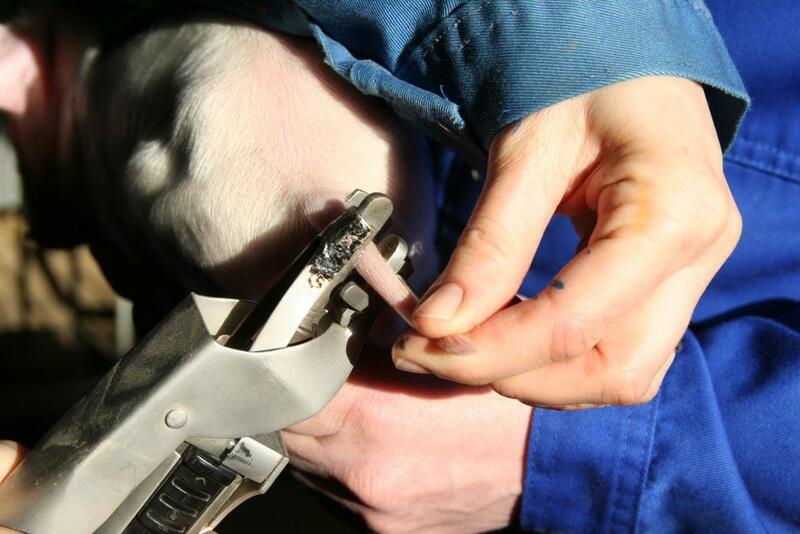 Tail docking is applied to young piglets to avoid a potential problem later of tail biting. However, should the root of the problem be looked at instead of using this preemptive measure? Tail docking is routinely performed on farms as a means to decrease the prevalence of tail biting. Tail biting is an abnormal redirected exploratory behaviour that results in mild to severe injury of pen mate’s tails. Several factors have been associated with tail biting behaviour including environment, nutrition, gender, genetics and health status. Tail docking of piglets has and continues to be highly criticised in both the US and Europe. This is primarily driven by the fact that tail docking is a painful procedure as indicated by changes to the physiology and behaviour of pigs who are tail docked. Most recently, European countries have taken a stance to eliminate this management practice by managing the problems which lead to tail biting in the first place. Several research projects including FareWellDock have been established to provide scientific research to determine the best practices to eliminate tail docking and control tail biting. Although several factors can contribute to tail biting, research has consistently demonstrated that the absence of material for manipulation increases risk of tail biting. Several enrichment objects including chains, rubber hoses, car tires, straw and peat moss have shown to decrease tail biting but not necessarily eliminate the behaviour altogether. Unlike the European approach, the US is nowhere near implementing the elimination of tail docking on farm. Tail docking is still performed routinely on commercial swine operations in the US. Farms which are not tail docking are either smaller farms which provide outdoor access to pigs or farms on specified animal welfare friendly programmes like Animal Welfare Approved, American Humane and Certified Humane. For the second part of this article (on the probability of eliminating tail docking and the value of enrichment) see the original at the Pig Progress site (and see also the comment section). Bodin L, Algers B, Andersson M, Olsson AC, Botermans J. The amount of straw for growing- finishing pigs considering the reduction of time spent in manipulative behavior. Symbiosis J of Vet Sci. 2015, 1: 105. The behavior of rooting and digging is highly motivated in the pig. The motivation to perform this exploratory behavior is not reduced even after the dietary requirement has been fulfilled through feeding. The aim of this study was to identify the minimal amounts of straw needed to satisfy pig motivation for manipulation and reduce to a minimum the manipulating behavior of pigs directed toward pen mates. To determine the minimal amount of straw needed for conventional growing-finishing pigs, a study using 168 pigs provided with 7 different amounts of straw (20, 40, 60, 80, 100, 200 or 300 grams/ pig/ day) was performed. The straw was provided either once or four times per day. Behavior observations were made using focal animal sampling and continuous recording for one hour between 9 and 10 am and between 3 and 4 pm. The time spent by the pigs manipulating straw increased over 10% ranging up to 27% in all the pens receiving over 200g of straw per day compared to the range from 4-22% in pens receiving 20-100g of straw. Meanwhile, the time spent in redirected behavior decreased below 5% in all the pens receiving over 200g of straw per day. No significant differences were found when comparing pens provided with straw once or four times per day. NL: Waninge (In prep.) Prikkelvoer – Opvoeding biggen leidt tot minder staartbijten (Stimulation feed – Rearing of piglets reduces tail biting). Varkens (Interview with Prof. Valros). SE: Dr. Stefan Gunnarsson of SLU was interviewed about the FareWellDock project on Sveriges radio (17-7-13, in Swedish). UK: See the post on the UK’s media coverage to the press release issued by SRUC.